Ashley Brooke’s Spring Favorites Giveaway! It’s here, My Spring Favorites Giveaway!!! 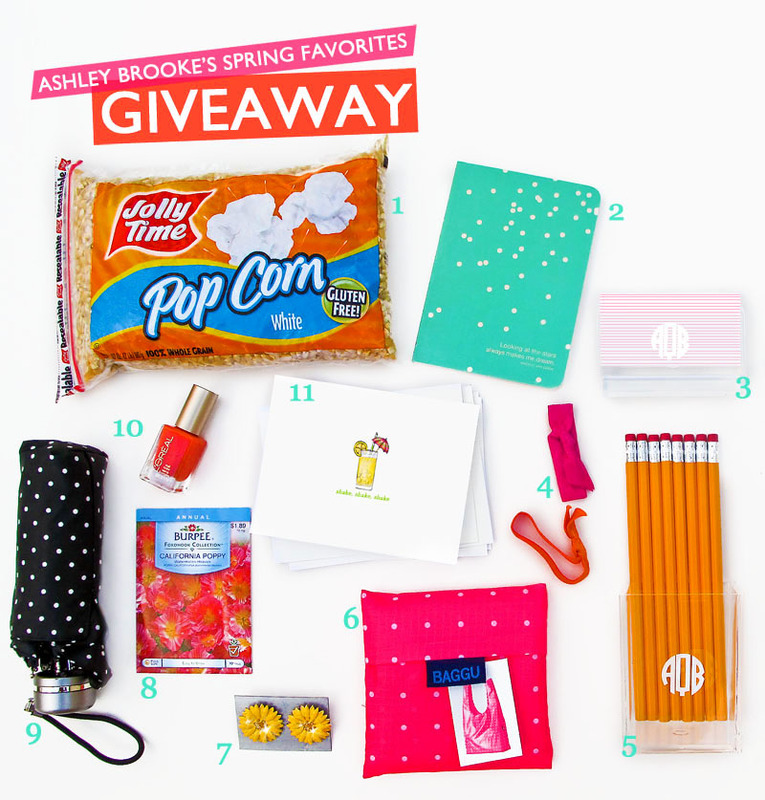 Like I promised on Monday… I’m giving away a few of my Spring Favorites!! I’m so excited about this fabulous giveaway, and I can’t wait for one very lucky reader to get this box of goodies in the mail. As you know I am doing a seasonal giveaway at the start of every new season/or Holiday (take a peek at what I gave away for my Fall Favorites, Holiday Favorites, & Valentine Favorites)! This is so fun, I hope you love my “favorites” giveaways as much as I do! 1. Jolly Time Pop Corn, there is no need to explain this… my obsession with pop corn is well known. 2. Gold + Tiffany blue confetti pocket notebook with the quote “Looking at the starts always makes me dream”. I always keep notebooks close by for all of my BIG ideas, and these are sized for handbag perfection! 3. Acrylic custom monogrammed business card holder from Design Darling… I am obsessed with Mackenzie’s online shop, and you need to be too! 4. Emi Jay orange and pink hair ties… B introduced these to me and now I wear them all the time! 5. Acrylic custom monogrammed pencil holder. I love my monogram and my pencils, so this was a match made in heaven! Once again Design Darling is the best! 6. A H-O-T pink and polka-dotted Baggu bag. You can tote all your favorite things in this bag, plus it’s all kinds of pretty! 7. Daisy Earrings (or “ear bobs” as we call them around here). I am obsessed with these as you can see here and on our facebook cover photo! These daisy earrings can do no wrong! 8. California Poppy seeds, you know, for your garden. 10. L’Oreal nail polish in “Boozy Brunch 102” it’s such a pretty color, but if we are being honest here I mostly purchased it because of the name. Ha! 11. And of course my favorite new Assorted Cocktail Cards, they are ADORABLE and you just have to have them! You have until Wednesday, April 18, 2012 at 12:00 p.m. EST to enter in this fabulous Spring giveaway! All you have to do is leave a comment on this post with your favorite Spring activity/lovely find/food/etc.! Repin this pin on Pinterest here!